Blowing Our Own Trumpet - First anniversary of The Sketch with a drawing by Dudley Hardy - front page within text. First Year of The Sketch - Houp La drawn by Phil May - Full page showing a circus scene. Miss Ada Blanche as Robinson Crusoe, At Drury Lane Theatre - Full page photograph by Alfred Ellis of Upper Baker Street NW. Miss Lena Ashwell as Liza in The Piper of Hamelin At The Comedy Theatre - Full page photograph by Russell of Baker Street W London. The Fire at The World's Fair Chicago - from a drawing by Hughson Hartley or Hyghson Harty?. Last Weeks Paris - at Courcelles Levalois, a stout French butcher and his problem with getting on the train; and carriage scene on the Promenade des Anglais - Full page sketch by Villedebois or Ville de Bois possibly. Pelagia and Philammon (Kinglseys Hypatia) By Arthur Hacker ARA. Illustration from Harpers Weekly showing the artist "Little Billie" from George Du Mauriers "Trilby". Mr Probasco - photograph by Frampton and Work, Punxsutawney USA - shows the trainer and owner of the Wonderful talking Horse, the clever Australian Mahomet - with a sketch of the horse and blackboard on stage. Mahomet a horse; as above. Oriel Bill The Oxford University College Bulldog - Dressed up and in different poses. Full page showing x4 photographs by J Soames Junior, Oxford of the dog dressed as a rugby player and a judge or lawyer. Mr Andrew Lang the Writer - photograph by T. Rodger of St Andrews. Sir John R. Robinson - newspaper editor of The Daily News. Mister P. W. Clayden - Journalist. Mr Herbert W. Paul MP . Novel in a Nutshell entitled "Two Women and A Man" by Nora Hopper - three illustrations by Ray Potter. 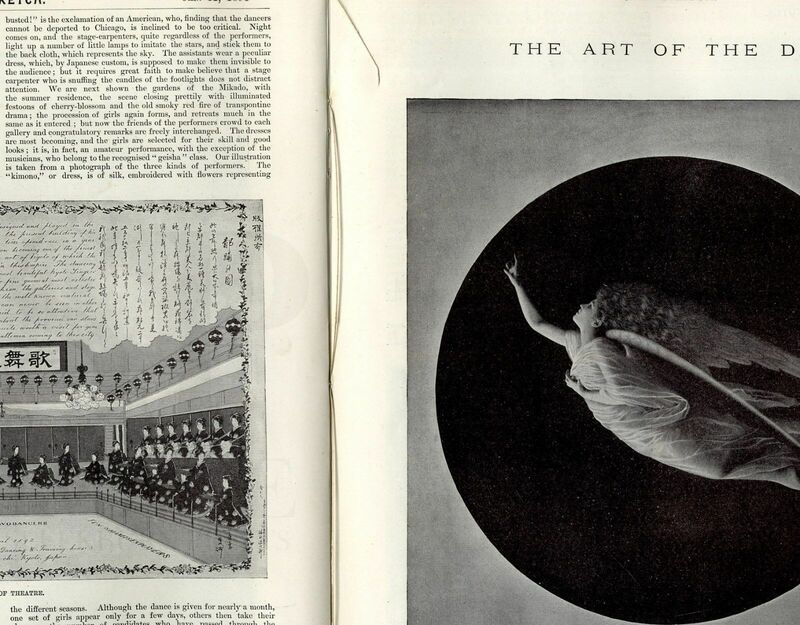 A Japanese Doll - two photographs of the doll to accompany an article entitled Mr Dolland telling a story from a dolls eye view which was in the ownership of an American actress Miss Wallace. The Hon. Nellie Bass - wonderful full page photograph by Lafayette of Dublin - info. Nellie Lisa Bass (later Baillie later Melles) daughter of Michael Arthur Bass or Baron Burton. Mr Arthur Hacker ARA- artist. Percival, Son of MR Hugh E. Hoare MP by Arthur Hacker ARA - from the painting. The Harem at "Constantinople" in London - full page showing two photographs of ladies in beautiful Ottoman Turkish costumes, one smoking a hookah style pipe etc. The Cherry Blossom Dance in Japan 'Plan of The Theatre' interior at Kioto in Japan. With a very descriptive article describing the Festival of The Cherry Blossom Dance - I cant say who the artist is, as it is in Japanese. Art of The Day: Morning Star - a beautiful full page sub-titled below Reproduced from one of Messrs Marion and Co's photogravures, after an art study by Messrs W. And D. Downey; the work is signed by W. Downey; produced by Andre & Sleigh. A Landscape by Richard Wilson RA. The Centaur by C. De Lort . A full page showing: The Empty Punch Bowl by R. J. Gordon ABA - Charmion by Arthur Greenbank - Purple Iris by H. T. Schafer RBA - Clematis by H. t. Chafer RBA . Les Defenseurs De Saragosse by M. Orange - half page. Info. The defenders of Saragossa or Zaragosa or Saragosa. The Light Side of Nature Drawn by Phil May - full page comical sketch. A Gay Youth of Yore - with verse: There was a gay youth of yore, Who became a terrible bore, His mother she beat him, And on the floor sat him, To cool down the part that was sore - amusing full page cartoon sketch by Rene Bull. Masher and Dog Fancier - amusing full sketch by Fred Hall - Masher being a squat bull terrier type dog. The Missionary and The Sailor - amusing full page sketch by James Greig. The Carnival in Paris - full page sketch by "Mars" aka Maurice Charles Mathieu Bonvoisin, and engraved reive by C. Hentschel; shows dancing girls and male admirers; plus a girl dancing with a pierrot type. The Gunpowder Conspirators Rendezvous: Catsby's House at Bushwood Hall,Henley in Arden - within an article to commemorate the anniversary of the execution of Guy Fawkes. Jottings at Constantinople: A Leaf from a Sketch Book - full page of sketches by Ernest Goodwin. A Flying Fairy: Mlle Aenea at The Palace Theatre - wonderful and unusual full page sketch by J. M. Price. Info. Mlle Aenea aka Letitia nee Barry wife of Walter P. Dando. Mr W. P. Dando Working the Machine up in the Gridiron - for the flying fairy illustrated (opposite). Info. Walter Pfeffer Dando (see also article). The Serious Side of Nature: A Plague Stricken Ship, A Sailor Boy Hero - full page sketch by Melton Prior - the article reads "...advices from Melbourne contain intelligence of the arrival there of the Glasgow Four Masted Ship Trafalgar, From New York and Batavia, on Dec 17, in charge of an apprentice, William Shelton aged eighteen. Captain and officers had died of Java fever. Full page. c.keenlyside. Gustave Duchamps - photo by Z Chiesi of Paris of the rugby player. The New Diver: Miss Annie Luker - info. diving. The Late Sir Gerald Portal. The Literary Cranks of London: The Johnson Club (logo) - The Johnson Club Anniversary Supper 1893 Menu etc. - two illustrations/menu. The Lawn Chemical Manure Company: A Shield for the South Island Farmers of New Zealand. Geraudels Pastilles - half page (hp) advert. Association of Diamond Merchants, Jewellers & Silversmiths - hp adv. showing twenty four jewellery designs incl. Mandoline Diamond Brooch - Ruby Sapphire Double Heart Brooch - Mercurys Wand Brooch - Violin Brooch Diamond - etc. Full page of adverts incl. Ball Dress from Thorpe & Co. - London Glove Co. - Benson Lady's Keyless Lever Watch - etc. Mr Harding Cox - Jockey . Household Hints include A New Settee - A Pretty Music Stand - Miel - A Useful Piece of Furniture - Bureau Desk - Silver Tea and Coffee Service - Bracelet Presented to The Hon. Nellie Bass. 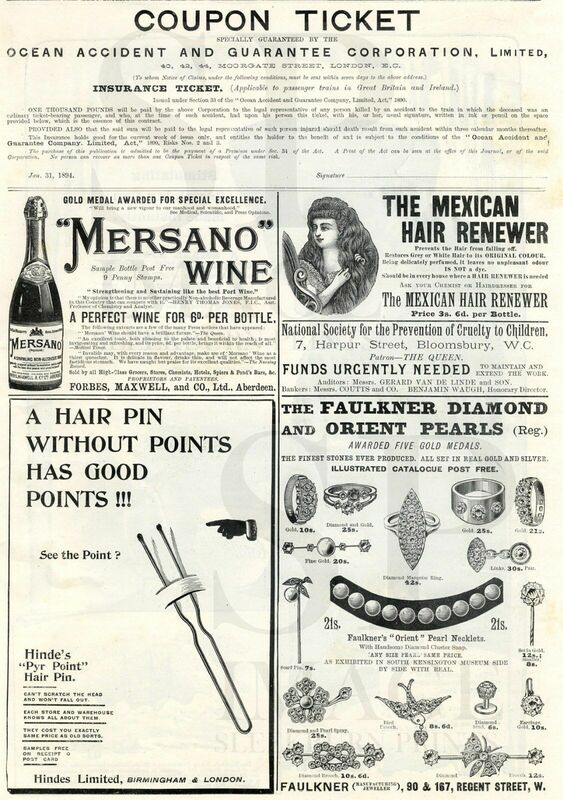 Full page of adverts incl. Carbolic Smoke Ball Co. . The Mitchell Corbett Fight: Jem Corbett - Charles Mitchell. Info. Two photographs relating to the boxing match between James J. Corbett nicknames Gentleman Jim, and Charles Watson Mitchell aka Charley Mitchell at Jacksonville Florida. The name on the Corbett image "Jem" is possibly a misprint. 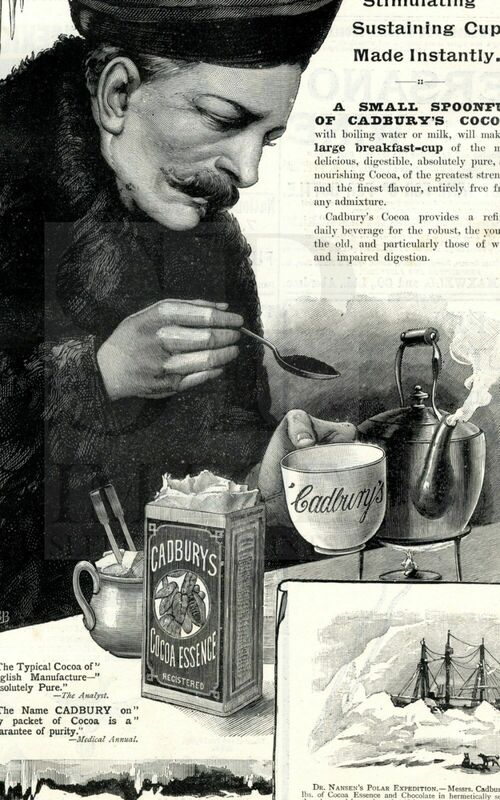 Cadburys Cocoa - full page advert shows an engraving of Fridtjof Nansen of the Fram expedition making a cup of cocoa. Leopold Wenzel - A Monograph by S. L. B. The Play and its Story - The Transgressor at the Court Theatre - a review by Monocle. A Pantomime Peri - plus the words of a song sung by Miss Lena Ashwell. Last Weeks Paris by "Mimosa". Small Talk - with mention of the marriage of The Hon. Nellie Bass - Mr James Evan Bruce Baillie - Sir Spencer Ponsonby-Fane - The Royal Yacht Victoria and ALbert - Dowager lady Churchill - Duchess of Albany - Mr W. J. Fox of the Daily News- Mr Sutton Vane - George Roadnight the bus Conductor (caught a pickpocket) - Mr Robert Stanley - The Newsboy Banker - Bridewell Prison - Miss Sarah Burns Hutchinson and other surviving members of the poet Burns - Harpers Weekly- Mr Stuart Cumberland - Mr Justice Lawrance - Relief of Asthma - Mrs Carnegie of the New York Yacht Club. sleekburnc. The Favourite of the London Music Halls: Interview with Mr E. L. Probasco about his performing horse "Mahomet" - by G. A. B. The Literary Lounger by O.O. (info. William Robertson Nicoll). The Book and Its Story - Review of Prince Ricardo of Pantouflia by Andrew Lang. Journals and Journalists of Today - Sir J. R. Robinson and The Daily News - by E. F. S.
A Novel in a Nutshell By Nora Hopper - Two Women and A Man - Short Story. Mister Dolland by D. L.
The Cherry BLossom Dance in Japan - by K. H.
Gunpowder Conspirators' Rendezvous- info. Robert Catesby related to the Guy Fawkes incident. A Flying Fairy by J. M. P. - an interview with Walter Pfeffer Dando. Info. Dando was a British stage engineer and later a film director. The Late Sir Gerald Portal - info. British diplomat, Consul General British East Africa, and Special Commissioner to Uganda. The World of Sport - Football - Cricket - by Olympian. The New Diver Miss Annie Luker - by F. M.
The Johnson Club - by L. F. A. (L. F. Austin) - info. a London dining club founded in February 1764 by the artist Joshua Reynolds and essayist Samuel, with Edmund Burke, the Irish philosopher-politician. An Extraditeds Lament - A Voice from the Bow Street Cell. Racing Notes by Captain Coe. Our Ladies pages by Florence - info Florence Fenwick Miller (b. London 1854 - d.1935Hove, Sussex) a British journalist and lecturer..
Notes from the Exchange - All is not Gold that Glitter by "S. Simon Esq of Lamb, Shearer and Co.". The Mitchell Corbett Fight at Jacksonville, Florida, USA with weight/height measurements of each man etc. The Sketch was a British illustrated weekly newspaper with a high photographic content, published between February 1893 and June 1959, by the Illustrated London News Company. It was primarily a Victorian society magazine with regular features on royalty and the aristocracy, music hall, theatre, sports and arts. Twenty seven pages (54 sides) approx. It measures 360 x 250 mm (14.25 x 9.75 "). The orig. advertising wrap/cover is missing. The front page (frontispiece) is intact. The spine is loose with binding witness marks where once bound. There is some age yellowing with some spotting. Some of the pages may be loose, and have minor cuts tears and blemishes due to their great age - anything more than minor will be mentioned in the main body of the description. The engravings/images vary in size. There are no colour images unless otherwise stated. There are no outer advertising pages/cover unless otherwise stated. This item will be packaged in a tube. The four digit number in brackets in title is for my ref only. The descriptive text in my listing, details the content in my words and not necessarily what is written on the original page. "Info." in the description is my research, although relevant to the accompanying image or article, is not necessarily in the printed text. All text descriptions etc. in our listings are protected through copyright law, and have been electronically and invisibly coded. Reproduction, in whole or part, without written permission is a transgression of copyright.